(*) Meteorologic data from our own meteorological station in Destnice near Saaz. 30-years average (1961 – 1990) according to Czech Hydrometeorological Institute. As to the temperature June was slightly above the average and extraordinary as to the precipitation. In some places of Saaz district during the storms the precipitation was higher than the measuring data of our weather station in Destnice. During the storms the hails were observed in certain places however it caused significant damage only sporadically. 4 hectares of hop gardens fell down due to the windstorm on June 25 in Saaz area. 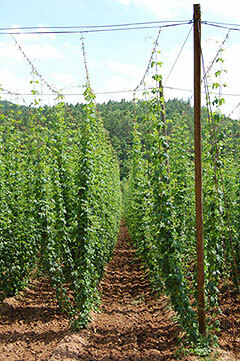 In the period of June 12th-17th very low temperature was measured and so it influenced the hop growth negatively. Most of the hop gardens (approx. 80 %) reached the top of the trellis till the end of June. Hops are in the stage of side shoots formation. Chemical protection agains hop aphids and peronospora was done in June. Present health state is very good. The enclosed photo shows the typical hop-garden phase at the end of June.